The La-200 is a Rank V Russian jet fighter with a battle rating of 8.0 (AB/RB/SB). It was introduced in Update 1.77 "Advancing Storm". 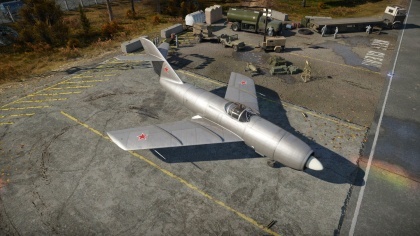 It is last aircraft in the "Lavochkin end" of the research tree. ? ? 13 500 ??.? ??.? ??.? ??.? ??? 1 123 450 650 ~?? ~? Speed is your greatest advantage. The La-200 can outrun every jet at its BR and even some 9.0 jets. At the beginning of a match try to gather speed as soon as possible. In an 8.0 game, if you accelerate up to about 1000km/h noone will catch you even if they dive on you. You can use your speed to zoom climb and surprise any climbing (or AFK-ing) players. Remember that other fighters will be more maneuverable and that you can't afford taking any hits (top speed drops horribly if you get hit). Always make sure that you have enough energy to run away from the enemy if you miss. And you will miss a lot, the 37mm cannons are hard to lead and quite inaccurate, so I wouldn't recommend using them on long distances. They are, however, extremely effective when they hit (one shot is almost always enough) so it's possible to get many kills without landing. The La-200 is equipped with a Toriy search radar, located in the radome in the centre of the air intake. 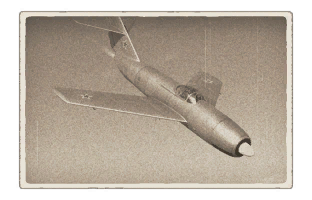 In 1948, Soviet high command issued a requirement for a two man, all-weather, twin -engined jet interceptor that would be capable of carrying a new type of radar system called “Toriy” (Thorium). All three Soviet design bureaus (Lavochkin, MiG, and Sukhoi) developed a prototype for testing. Lavochkin’s design, the La-200, had a long fuselage to accommodate its two turbojet engines, swept wings, and a large cockpit for two men. The La-200 took its maiden flight on September 9th, 1949. It was the only aircraft of the three designs to pass initial trials. By the early 1950s, the La-200 was ready to enter production under the official designation La-17. However, due to the appearance of the Yak-120 (later known as Yak-25), which surpassed the La-200’s performance in testing, the La-200 order was cancelled in favor of the Yakovlev design. Only a single prototype of the La-200 was ever built, and it was modified several times during development to improve performance, correct flaws, and test other radar systems. This page was last edited on 21 April 2019, at 10:27.